On a recent version of the SAT, there was an essay question about the implications and impact of Reality TV on American society. Ten years too late, SAT board - if I'd had that prompt, maybe I could have gotten into an Ivy, or (gasp!) Stanford. Students have inevitably taken up arms against the question. I completely agree with their complaints: someone who watches Reality TV will have a much easier time responding. A student knowledgeable about the genre could provide, or at least have in mind, specific examples that would support their argument or even help them form a convincing response. 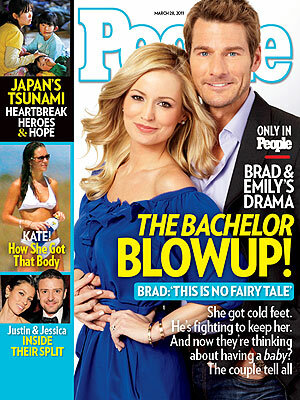 (For instance, they could mention how awful it is that the cover of this week's People Magazine features Brad and Emily's rocky engagement while confining the tragedy in Japan to the sidebar, just above the discussion of Kate Middleton's bikini body). So yes, the question is unfair. Reality TV does have an impact on our society, for better or worse, and as informed citizens, high school students should be able to discuss it. Not that they shouldn't also be informed about politics and the global economy (etc. etc. etc.) but that doesn't preclude an an awareness of television culture. In fact, pop culture is the easiest of any "subject" to learn - it's the most accessible (literally and intellectually) and takes the fewest brain cells to process (though probably kills the most). I'm not suggesting that sixteen-year-olds should be forced to watch Jersey Shore and America's Next Top Model, or that they need to know that first-ever Survivor winner, Richard Hatch, is back for another stint in prison. But they should absolutely be able to form a clear argument about one of the most important American cultural phenomena. And really, now that the SAT is out of 2400, no one over the age of 18 really knows what your score means anyway.